Do you pop pills whilst travelling? Malarone is the anti-malaria drug du jour it seems. It is sold as a safe way to protect yourself from malaria, and one of its main selling points is that it is supposed to have very few side effects when compared to the old school mefloquine. This is the part I failed to realise prior to our recent trip to South East Asia. FEWER side effects. Not none. We paid a grand total of £400 to get ourselves kitted up with malarone – the pediatric variety for the kids, and the normal stuff for us. However, the fun started a couple of days into the treatment. We were already in Bangkok, when I started dreaming the weirdest dreams ever (including the two times I’ve used gas and air during childbirth). First I put it down to jetlag. But five days later I could no longer make excuses for the obvious side effects of Malarone. My dreams went from horrid nightmares to soppy soap opera like dramas. They were about people I had forgotten I remembered about. They made me laugh, cry and they instilled me with fear. To add insult to injury, in between all of this, I would wake up and spend hours upon hours lying wide awake in bed. So did my husband. There we were, staring each other in the eyes, with a mosquito net above us in the insane thai heat. It may sound romantic to some I suppose, but I can assure you, it was exhausting. Especially considering the kiddies were ok. They slept all night, woke up bright and early, and quite rightfully expected the day to start as soon as the birds started singing outside. One night we’d had enough. We had reached the point where malarone was actually preventing us from enjoying our holiday to its full potential. – Do we really need to take this stuff anymore? I whispered to my husband. – I don’t know, he replied. Just ten days prior to this little nocturnal conversation, we had both felt convinced that the right thing to do was to protect ourselves against malaria. We had read extensively about the areas we were going to (Northern Thailand, Laos and Ko Chang), and felt the message from the World Health Organization was clear. Here is a link to their interactive map containing information on malaria risks around the world. We had of course brought with us plenty of repellent as well, the type containing DEET. But wise from previous trips, we knew that the repellent would only have the expected effect on my husband. The rest of us get bitten (eaten up in fact!) all the same. The time had come to pick the brains of local expats. In Nong Khai, we stayed at the wonderful Mut Mee Guesthouse where people from all over the world gather to enjoy their lush garden view of the Mekong. It is run by a deeply knowledgeable British man called Julian and his lovely thai wife Pao. The place is frequented by lots of interesting people. You know, the type who with a nonchalant manner say they don’t work – they just travel. I am sure you’ve met these vagabond wizards along your way. The type who will be able to advice you on a great place to stay on the Island of Far Away, or in the Jungle of Beyond where Nobody goes. In brief – wherever you’re going, they are sure to have been there. Mut Mee meditation in the foreground, the Mekong and Laos on the other side. So we started asking these destination saturated travellers about the need for Malarone. – Oh, get off it! seemed to be the unanimous answer. As it turned out, none of them were taking anti-malaria drugs. They said they probably would if they knew they were heading to the heart on a swamp infested jungle in a malaria endemic country. Having spent one third of our holiday already malaroned up, we were eager to get off it. 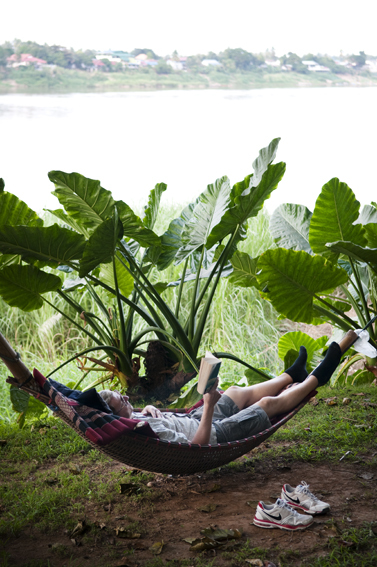 But we had one place left on our itinery which has long been reputed as a malaria infested area: the island of Ko Chang. Rumour has it that some ten years ago, this place was full of malaria. Then, once tourists started gaining an interest in the island, the Thai government sprayed the whole west coast of the island, and thus, eradicated the disease. However, these are rumours only. I believe malaria still prevails at the densely forested heart of Ko Chang, but few tourists today bother with anti-malaria medication if they are planning on a beach holiday. I can’t begin to tell you how liberating it felt to stop taking the malarone, knowing that once the medication had left our system, we would be getting our nights back. Our much needed rest. I won’t go as far as calling it beauty sleep. Travelling on over night trains and squeezing three of us into one king sized bed doesn’t qualify as rejuvenating. But four days later, I tell you, we slept like babies. All four of us! 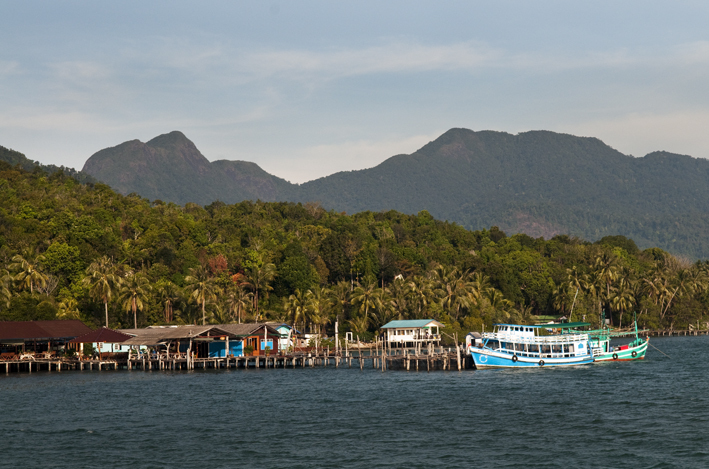 Fancy reading more about our Ko Chang adventures? Find out how the touristy Western coast compares with the more authentic East coast here. We took Malerone in SE Asia as well until my husband started to get heart palpitations. Soon the palpitations turned to full on anxiety attacks. We saw a heart specialist in Vietnam because we had no idea what was going on and we were really scared. After some tests including an ECG his advise was to get off the anti-malarials. We continued on throughout SE Asia for another six months with no problems. Hi Amy, I’m really glad to hear your husband was better once you were off the malarone. I guess now we know for next time! I’ve just been researching for a trip to India and have compiled a list of the cheapest places to buy Malarone in the UK. It might help if anyone still wants to buy some after reading this post. Had similar experience myself. I quit using the drug and just used local sold drugs that gave me no side effects and was a lot cheaper as well. Interesting Gunnar. Always on the lookout for alternatives to the usual meds – let us know the name of the drug if you remember it (please). Please do not use local drugs. Often these are sub-therapeutic doses and counterfeit, thus the lack of side effects. Also they are often only one anti-malarial. Malarone is a combination of atovaquone and proguanil. The WHO and most doctor/researchers recommend using drug combinations to treat malaria. This is to prevent the generation of resistance to the few drugs we have that still work. Drug resistance is a huge problem, especially in SE asia and using drugs from unreliable sources is a large contributor to the generation of resistance. Qualifications: I am a PhD studying malaria resistance in India and SE Asia. Wow!! Having just returned from a trip to Africa where i was filled with daily anxiety, when I should have been filled only with joy, i was “glad” to read this. Sure, there were issues in my life that could cause some concern, but this was daily, hourly, worry, panic, anxiety. it took awhile to connect the dots but finally, i could conclude only one thing: Malarone caused it !! And my fellow traveler, the calmest, laid back person ever, had a full blown panic attack one night–palpitations pounding heart, shaking. I took the generic version . In the past, i’d had not problems with malarone. However, here are all kinds of documented problems in general with generic manufactured drugs. Maybe i got a bad batch. Who knows? I just wish i’d have figured this out from day one, instead of living with this for two weeks before tossing the bottle! Thanks to your article, i don’t feel that I’m alone with the effects of the supposed “no side effects” med.